I can't seem to resist walking past a patch of Cimicifuga racemosa in flower without tickling my nose with the delicate feel and fragrance. I've always found it hard to accept the common name "Bugbane", as the fragrance is quite pleasing, at least to humans. But the genus name tells you otherwise. Cimex means bug in Latin and fugare, to drive away. The other common name, "Black Cohosh" is a Native American term. It seems that recently the Horticultural Taxonomic Community has deemed it necessary to change the classification of this plant to Actaea racemosa. I think it will be a long time until the gardening public accepts this change, so until I delve more deeply into their reasoning, I'll stick with Cimicifuga racemosa. I have to admit though, it's difficult, without close inspection to tell the difference between the foliage of Cimicifuga racemosa and Actaea pachypoda when the plants are in early stages of growth. Once flowering commences however, there is no question. There is a related native species, Cimicifuga americana. Their foliage is somewhat similar, but this plant is much smaller in stature. There's also GREAT website with copious amounts of data on Medicinal Herbs called Herbmed. Herbmed, http://www.herbmed.org/ is an interactive, electronic herbal database that provides hyperlinked access to the scientific data underlying the use of herbs for health. It is an evidence-based information resource for professionals, researchers, and general public. It's a project of the Alternative Medicine Foundation and is provided as a freely available, public resource. What I like most about Herbmed is that it's non-commercial and they're not trying to sell you anything. Cimicifuga racemosa is a great plant to use as a focal point in your shade garden, as its imposing height and architectural stature stands out high above most other plants. There are a couple of very gardenworthy cultivars of the European counterpart Cimicifuga ramosa. 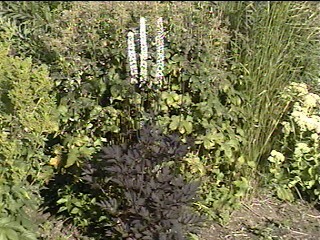 'Brunette' http://www.shared-visions.com/explore/gardens/Perennials/Perennials%20-C-.htm been around for about 10 years and Cimicifuga ramosa 'Hillside Black Beauty' http://pss.uvm.edu/ppp/aug01.jpg has the darkest foliage yet. Propagation is easy by the copious amounts of seeds set, but seed grown plants take several years to reach maturity. A mature rhizome can be divided easily into several pieces, make sure that each piece has a bud, they will reestablish quickly and usually flower the following year. Common name - genus - "Cohosh"
Common name - species - "Black Cohosh", "Bugbane"
Native range - Eastern United States. Spread - 18" - 36"
Height - 48" - 96"